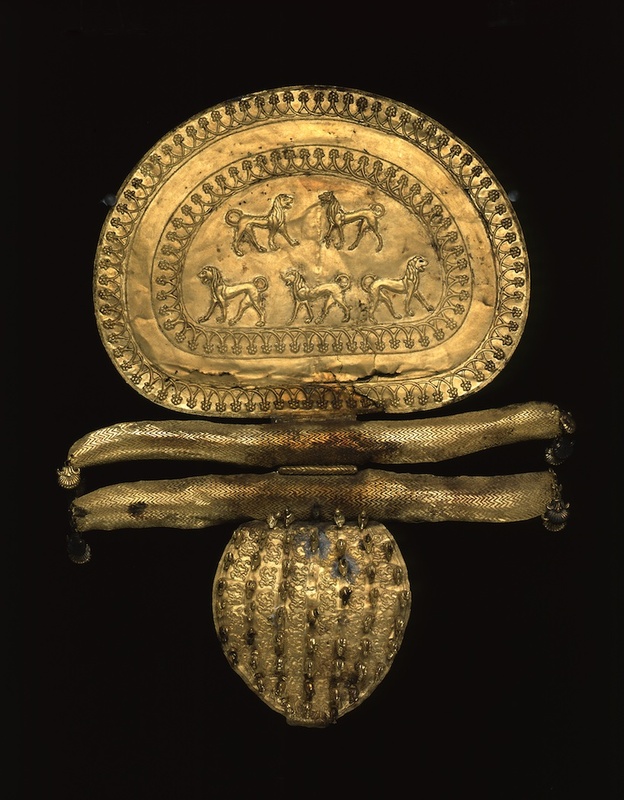 In a previous post, we outlined some ideas on the meaning of the disc fibula of the Regolini-Galassi tomb and of related disc fibulae as a symbol of rebirth, and we proposed a possible origin of that symbol in the Middle East. In a recent visit to the archaeological museum of Bologna, we found only one similar disc fibula although there are hundreds of fibulae on display in this museum. 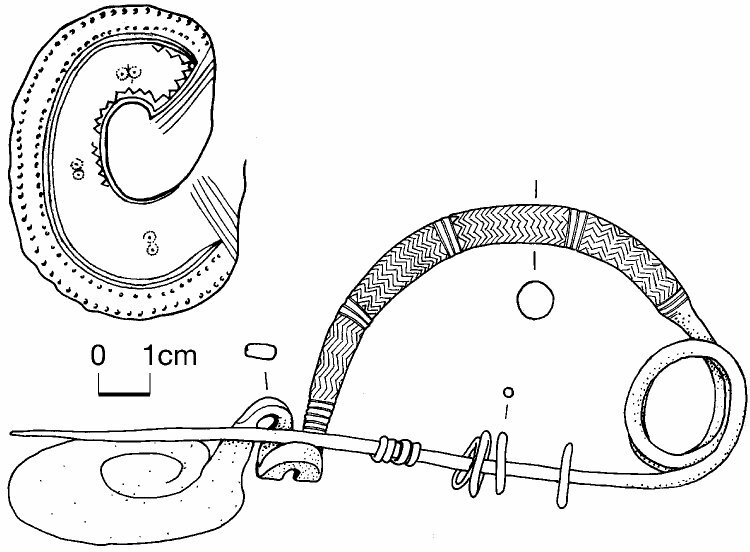 The simularity of this fibula is only superficial as it has the disc and the bow, but does miss the metal piece (or an attachment point) that symbolises the river. 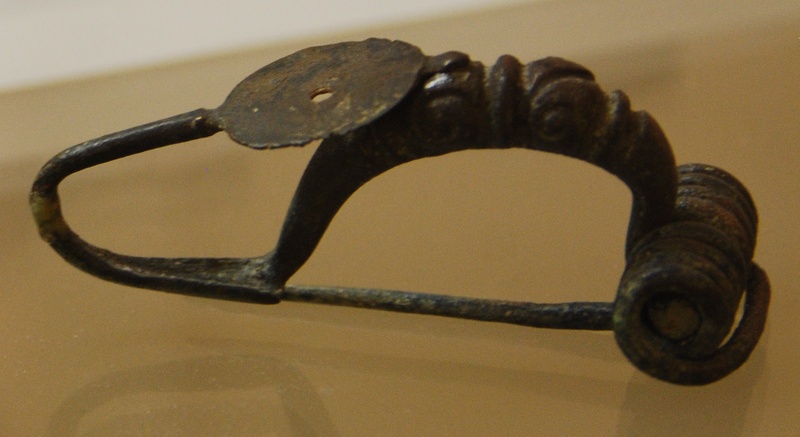 Also, this fibula is probably Celtic, not Etruscan. 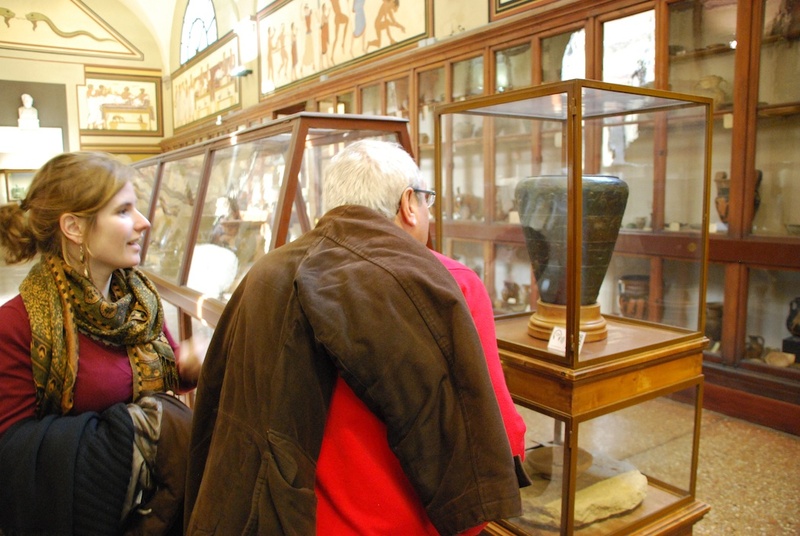 We also observed that in this museum nearly no golden or silver objects are present. This looks like an additional support for the proposed idea. 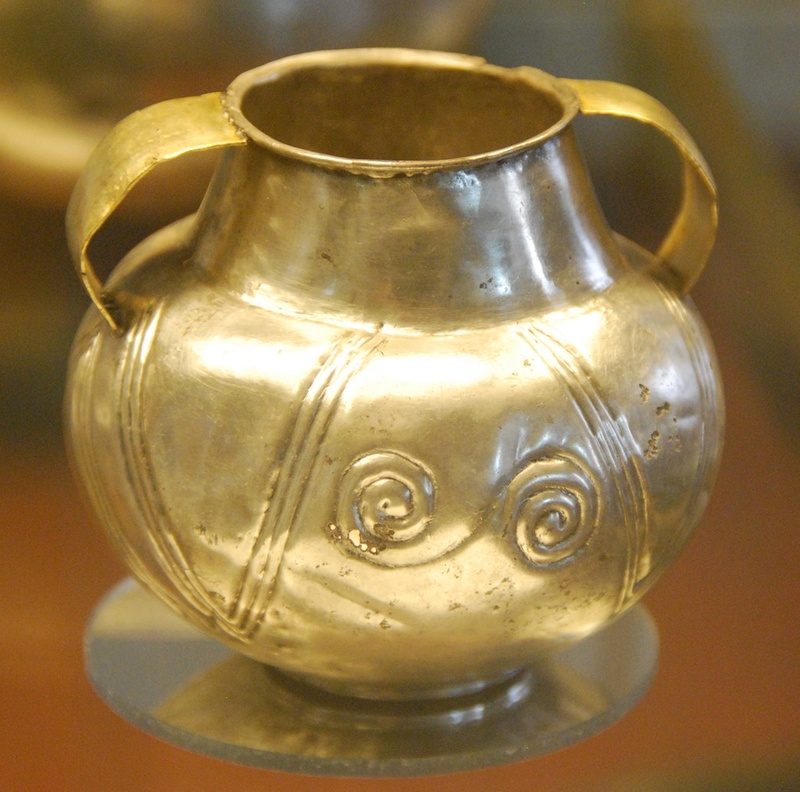 As the Bologna area did not have the gold and silver mines that Etruria had, there must have been less contact from this area with the Middle East, hence less influence by those cultures. 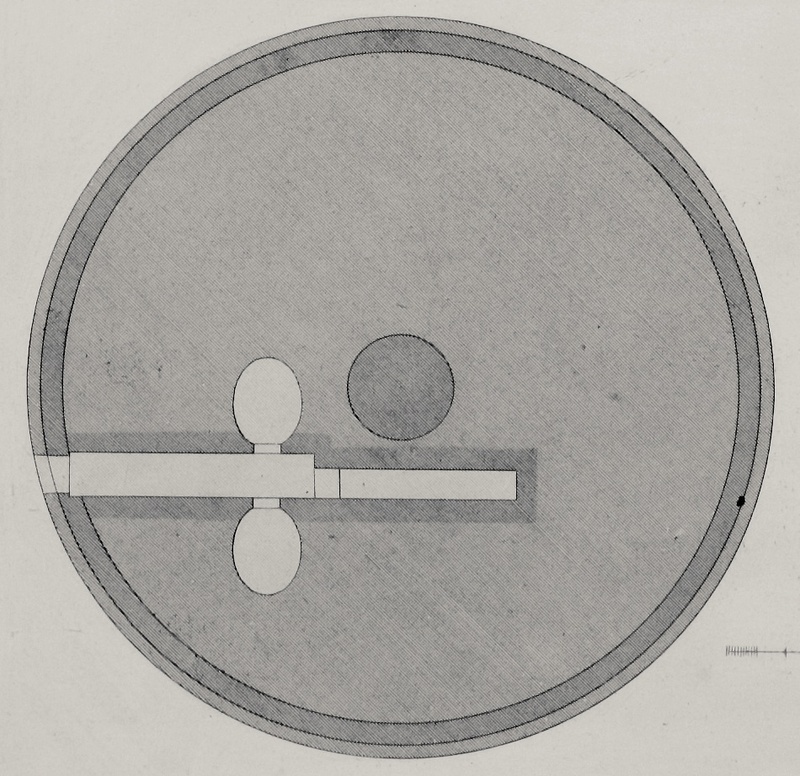 As we proposed that disc fibulae, such as the one in the Regolini-Galassi tomb, symbolise rebirth and as this concept was imported from the Middle East, it sounds logical that no such disc fibulae seem to have been found in the Bologna area. 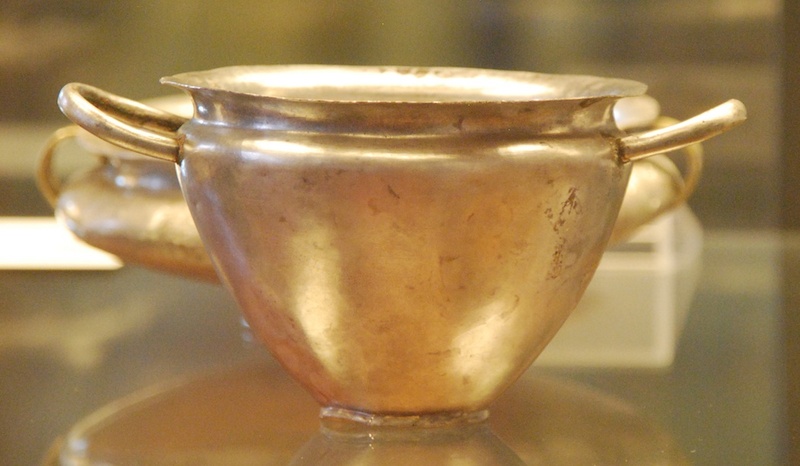 Also the influence of Etruria in this region happens in the 6th century BC, later than the orientalising period in the 8th and 7th century where we need to situate the use of these special disc fibulae. Again, all this needs to be proved by further research by specialists of Etruscan culture. 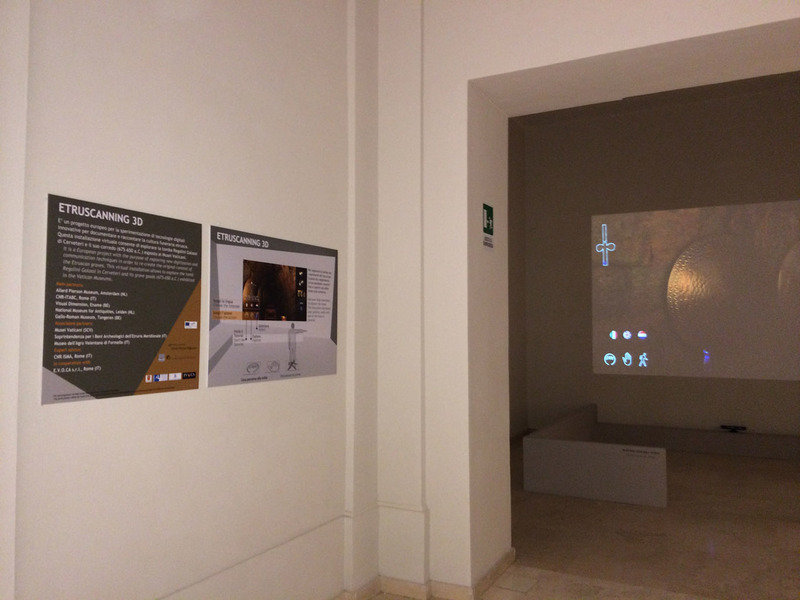 The new museum Palazzo Pepoli in Bologna, that opened on January 28, 2012 tells the story of the city of Bologna, from a Villanovan settlement to the city of today. 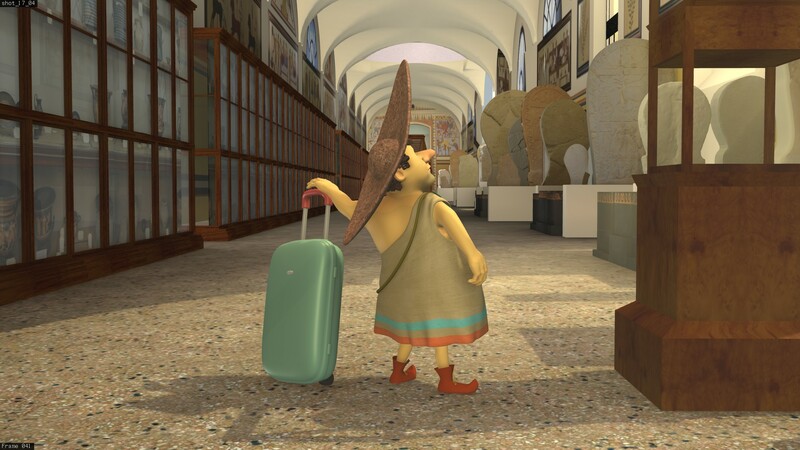 The museum contains a nice stereo 3D movie, made by CINECA, that features an Etruscan character called Apa, who was modelled on a flute player, depicted on a bronze situla from Certosa in the archaeological museum of Bologna. 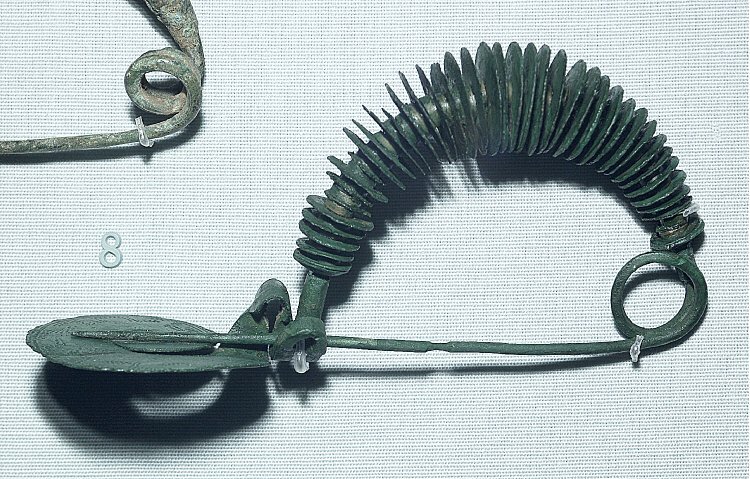 The ongoing exhibition Etruscans at the Allard Pierson Museum in Amsterdam and the National Museum for Antiquities in Leiden brings together many splendid Etruscan objects from several Italian museums. 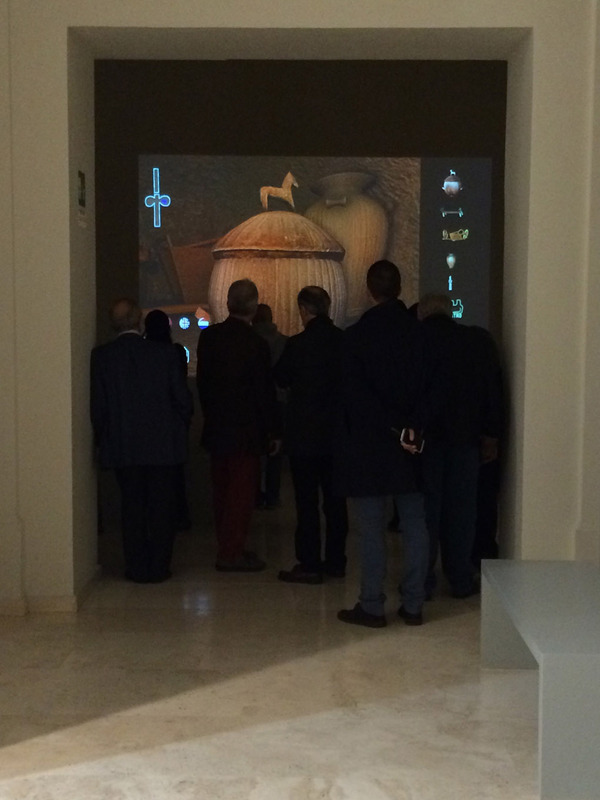 Through the Etruscanning VR application, many more objects are shown in a digital way. 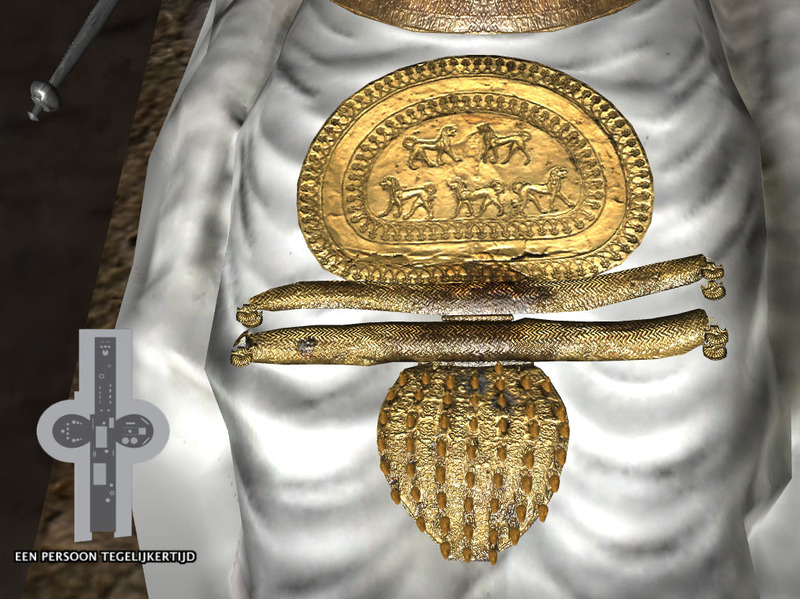 One of the most splendid objects that is shown in this VR application is a large golden disc fibula, that is shown on the body of the deceased princess that was buried in the Regolini-Galassi tomb. Only a few similar objects are known (see two images below). 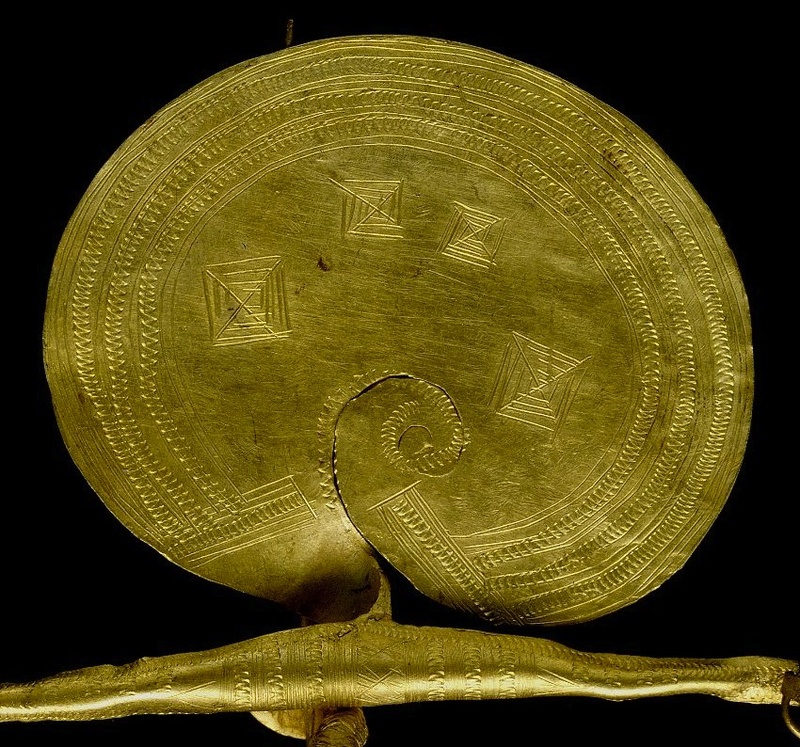 Maurizio Sannibale, the curator of the Museo Gregoriano Etrusco, where this large disc fibula resides, considers this object as a symbol of the transition from life (the top disc) to the afterlife (the bottom curved element) over the rivers (the middle bars) that separate the world and the underworld. 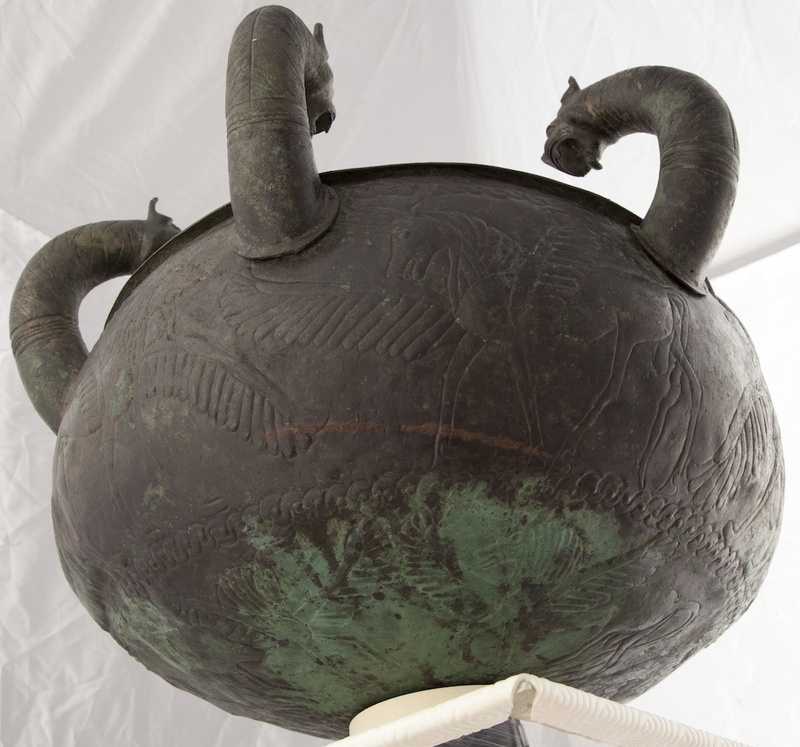 In this double exhibition in Amsterdam and Leiden, several objects are shown from the Etruscan collection of the Allard Pierson museum itself. Three of them are nice but small disc fibulae in bronze, that resemble another small disc fibula in gold in the British Museum, probably coming from Etruria. 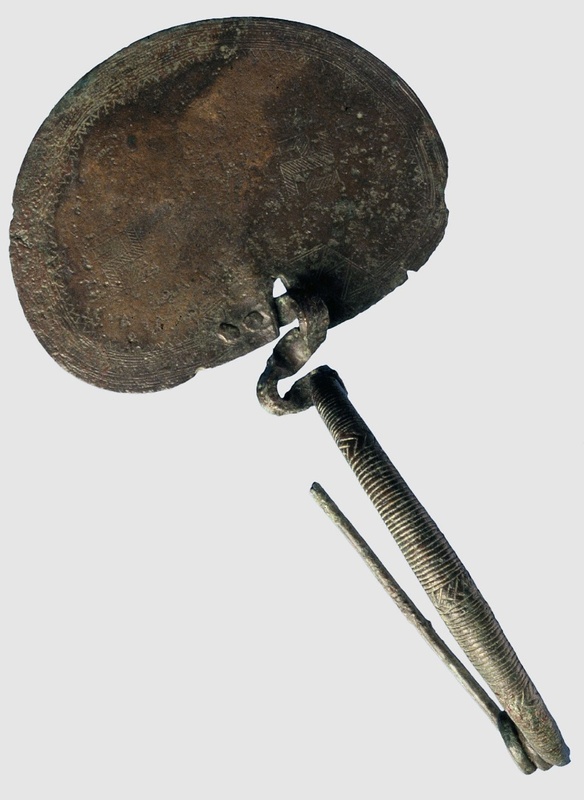 However, these disc fibulae from the Allard Pierson Museum reveal an important secret. 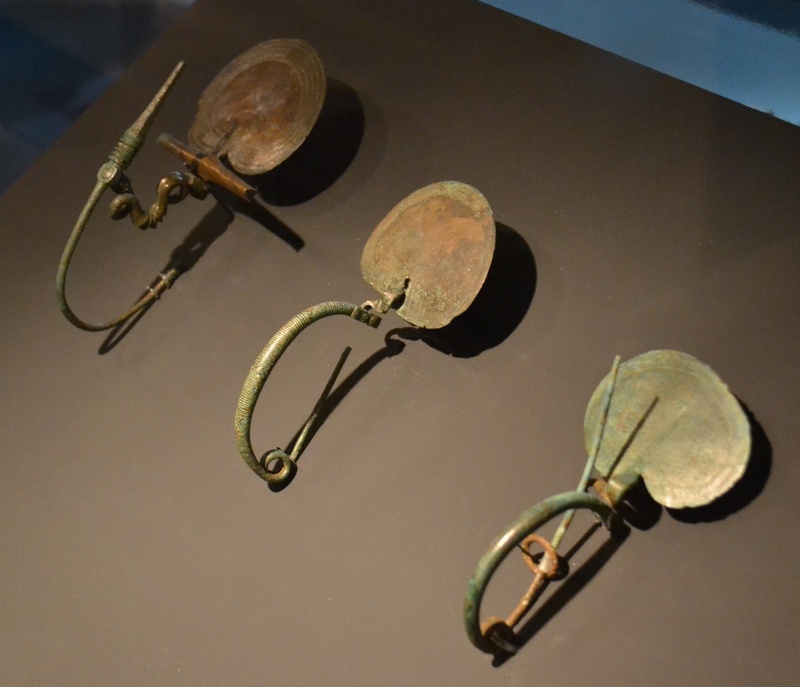 As can be seen on the photograph below, all three fibulae are very similar in shape, structure and size to the one in British Museum. Only the fibula on the left (see image above) has a middle part that depicts the river and has a slightly different bow. All three fibulae carry the same decoration (see images below) as the one in British Museum: the squares (maybe sun crosses) or swastikas on the top disc, the two or three bands that surround the top disc and seem to depict rivers through zigzag lines, the zigzag lines on the middle horizontal bar, probably depicing water and the zigzag lines on the bottom bow part. When we compare these four small disc fibulae with the two bigger ones that are depicted above, we see a striking analogy of the same symbols that appear on the same parts with very similar shapes. 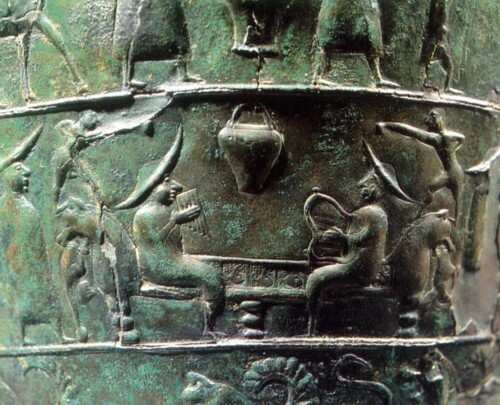 If we assume that the top disc depicts the world, this reveals the known depiction of the world surrounded by water on all sides, which is the first world model from the Bronze Age . 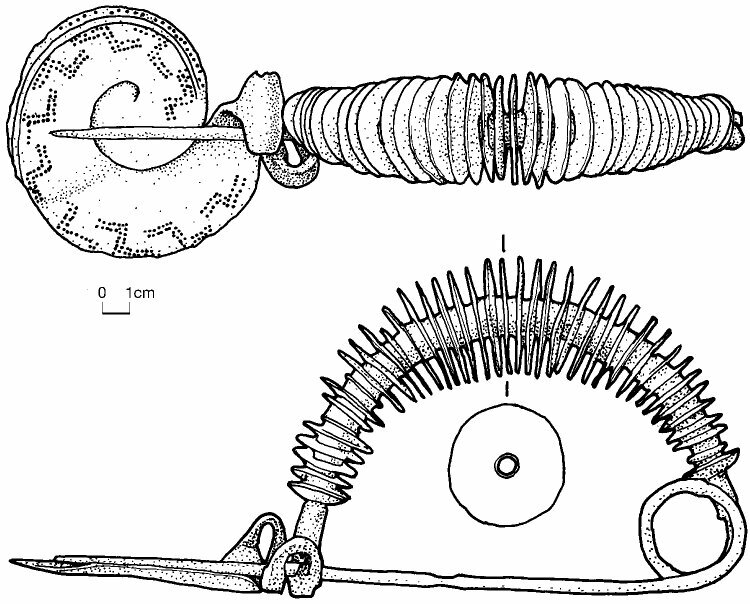 Closer inspection also reveals that the middle and the right fibula had also a horizontal bar attached on the small bow that protrudes just below the disc (see image above). In other words, we can assume quite safely that all fibulae shown here had a horizontal bar. This makes the similarity even more striking. 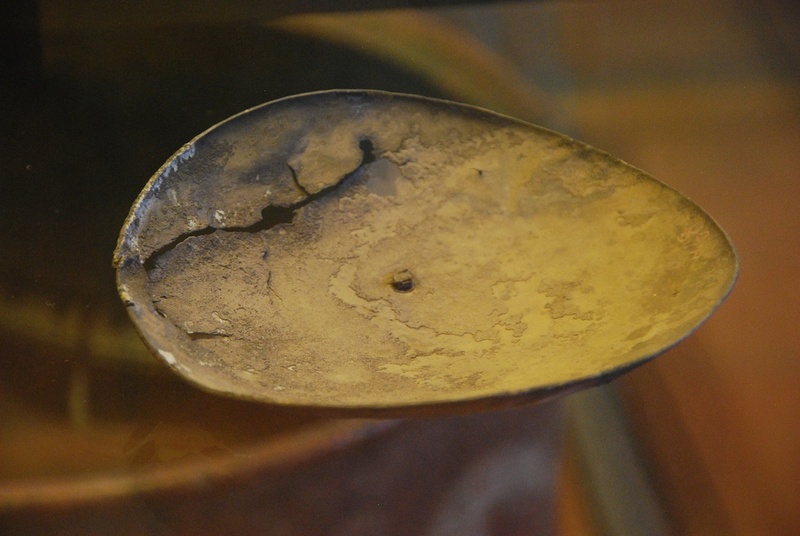 Note the horizontal bar probably detached easily as the surface of the small bow, on which it was soldered, was very small, hence proving that such fibulae were used for funeral purposes only. Based on this knowledge, we can identify many more disc fibulae that have the same characteristics: the disc (world) surrounded by sets of lines (water, rivers) and carrying depictions of life or swastikas, the small bow, to which the horizontal bar (river) was attached (but which is easily lost) and the bow, on which zigzag lines seem to depict water. 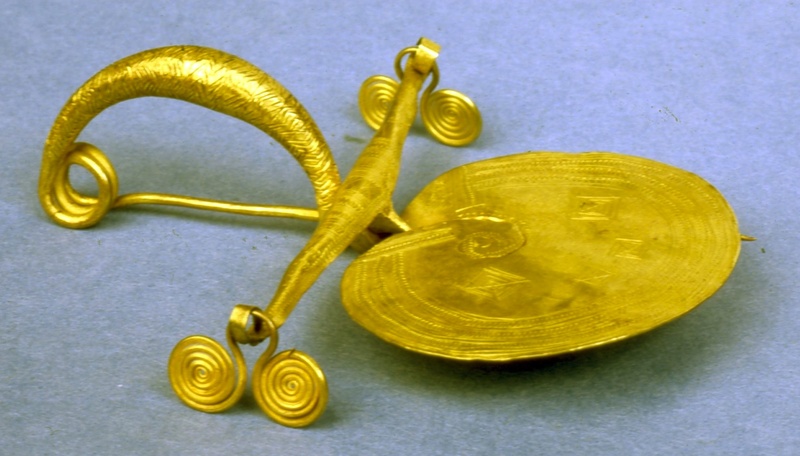 Below, we show one from British Museum, which is older than the other fibulae shown above. Many more fibulae can be identified if we allow a slightly wider variety of depictions of the same symbols. 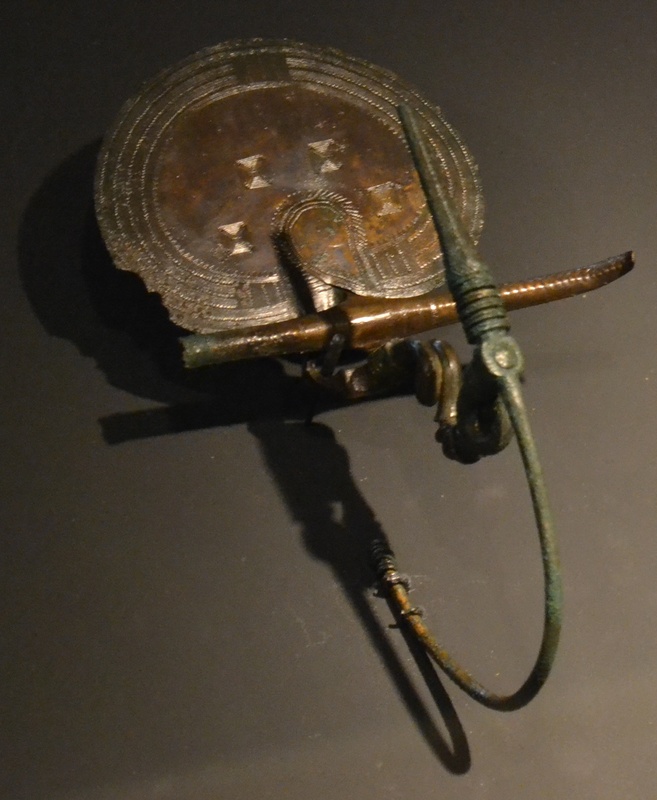 In the one below, from British Museum, the disc fibula below symbolises the waters around the “world” through one single ripple, very similar to the Ponte Sodo fibula shown above, while the water on the bow is symbolised through discs. 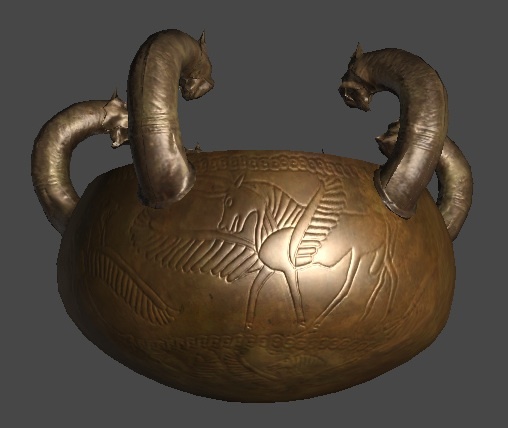 So, what has this to do with the virtual reconstruction of the Regolini-Galassi tomb? We have proposed two hypotheses concerning the placement of the fibula on the body of the deceased: or it is placed on top of the face, or it is placed on the abdomen. 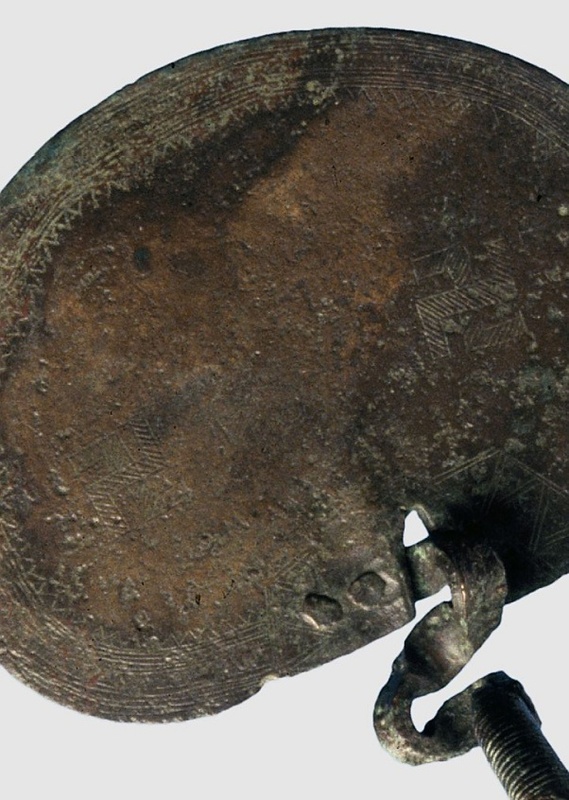 From the analysis above, we can conclude that the Regolini-Galassi disc fibula is not a decorative object, adorning the body of the deceased, but relates to an old symbol that seems to carry a consistent message of transition to afterlife, as the decoration and shape of these fibulae remain nearly identical over several centuries. 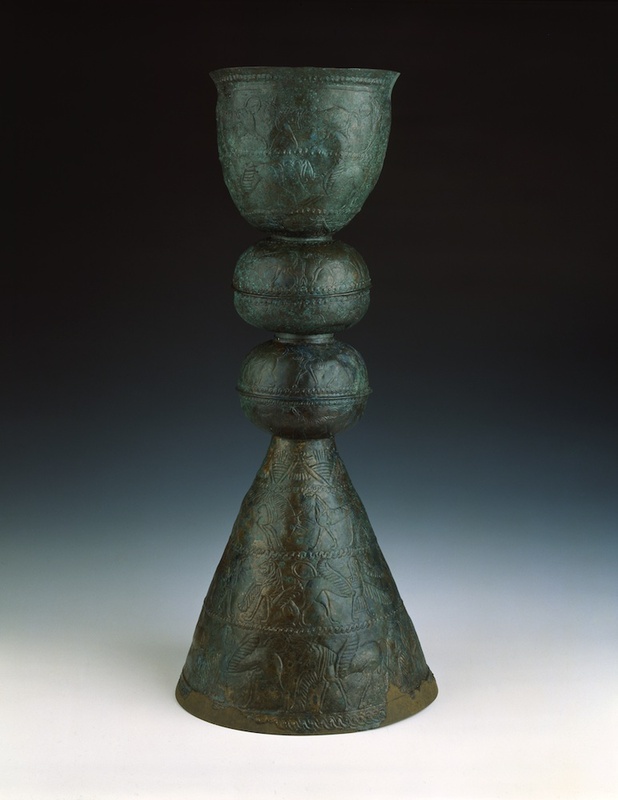 When trying to interpret this particular shape and decoration, we can make the link to the belief of the Etruscans that dying was being reborn. We could interpret the bow of these fibulae as the expanded abdomen or “baby bump” of women, the water symbol on the bow as depicting the water that surrounds the fetus. 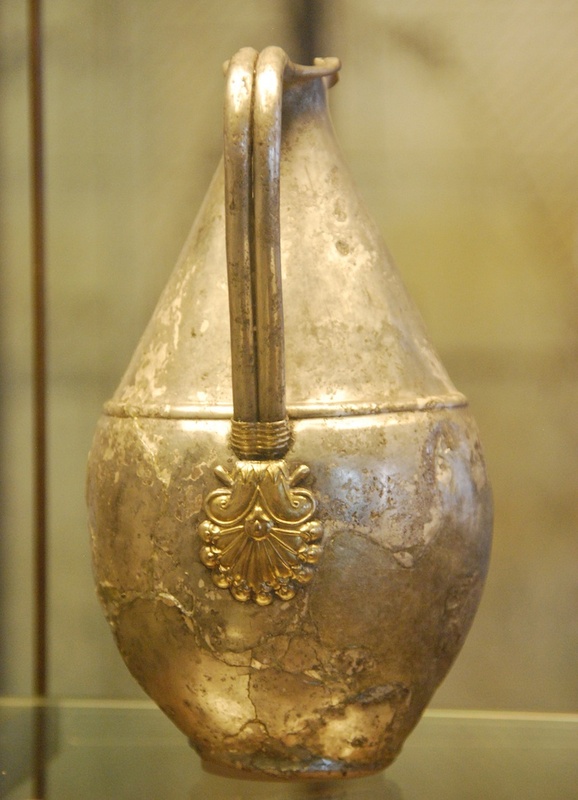 As each of the three parts of the fibulae carries the symbol of water, they probably also stress that water is the symbol of life, from birth to death. 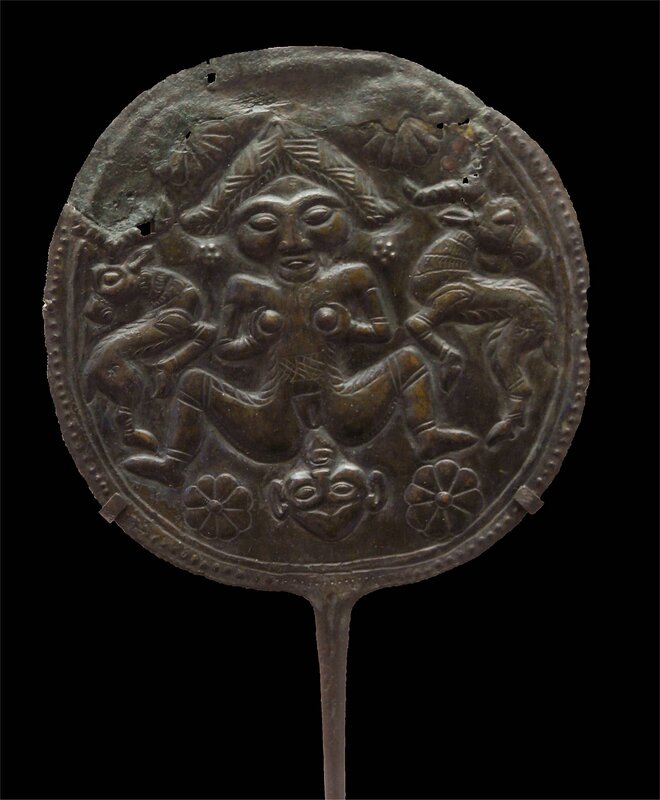 In this sense, these fibulae probably can be compared to an Iron age bronze fibula from a grave in Lorestan, Iran, on which a woman is giving birth. To conclude, we can state that the Regolini-Galassi disc fibula has a much higher chance of being positioned on the abdomen than being positioned on the face, not only because of size of the object but especially because of the symbolism of the object. 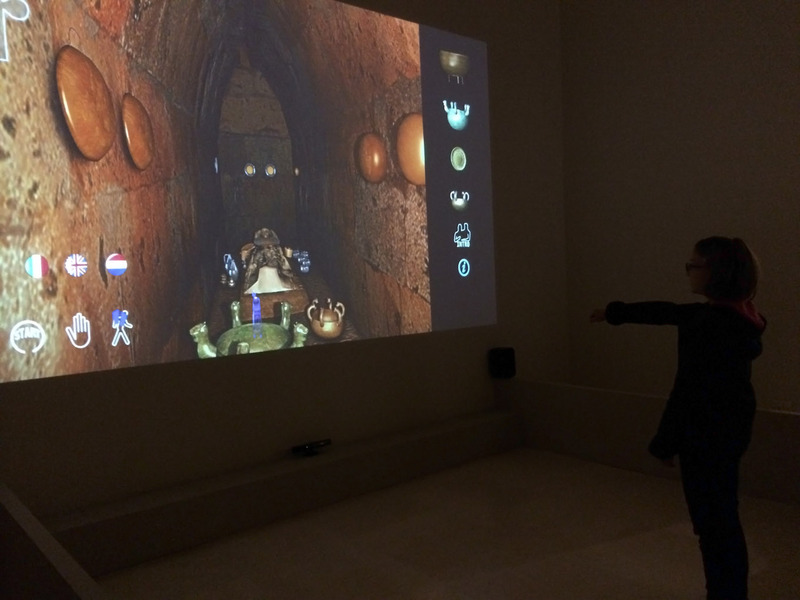 This blog is part of the Etruscanning project, that is being funded with support from the European Commission. This blog reflects the views only of the author, and the Commission cannot be held responsible for any use which may be made of the information contained therein. 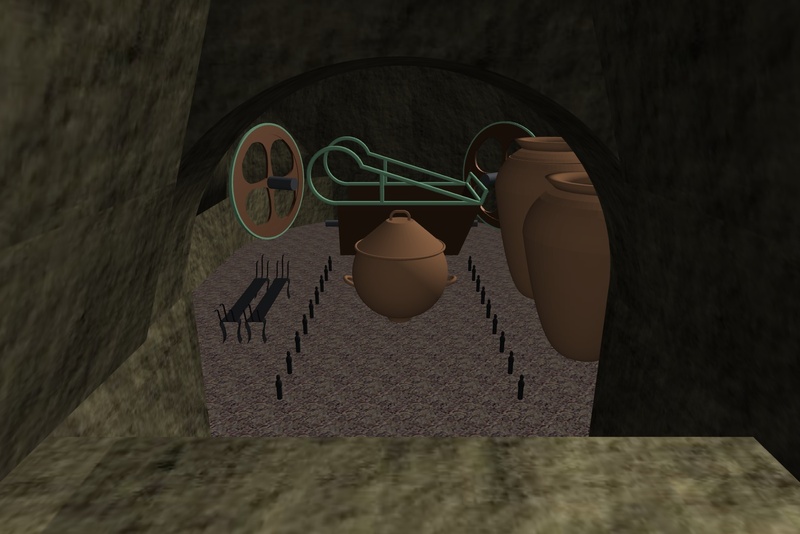 We made an update of the 3D model of the Regolini-Galassi tomb, implementing the latest conclusions and adding the objects that still were missing. Recent research by CNR-ITABC has shown that there is a floor under the current deposit of mud and that the dromos (entrance area of the grave) was still sloping downward (at a few degrees) towards the antechamber that has a level floor. This aspect has not been implemented in this reconstruction yet for simplicity. 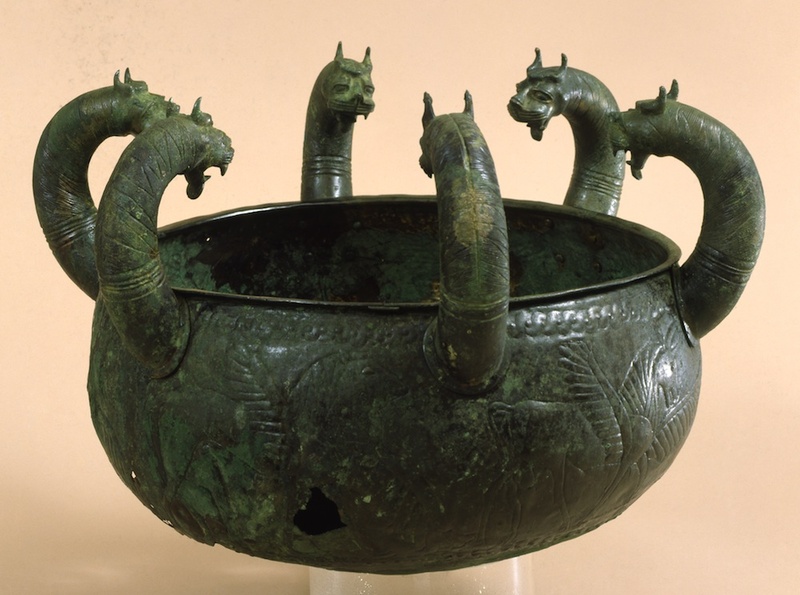 As explained in a earlier post, we choose to put the 6-headed lebes on top of the bronze holmos. We reconstructed the biga (war chariot) and have put it inside the right niche, next to the cinerary urn that contains the ashes of the warrior. We verified that the reconstructed biga, as present in the storage of the Museo Gregoriano Etrusco (but not currently on display as there are some doubts about the reconstruction), can enter the tomb and the niche when taken apart. The beam that connects the chariot to the horses (see photograph below) is not depicted but could fit inside the niche. 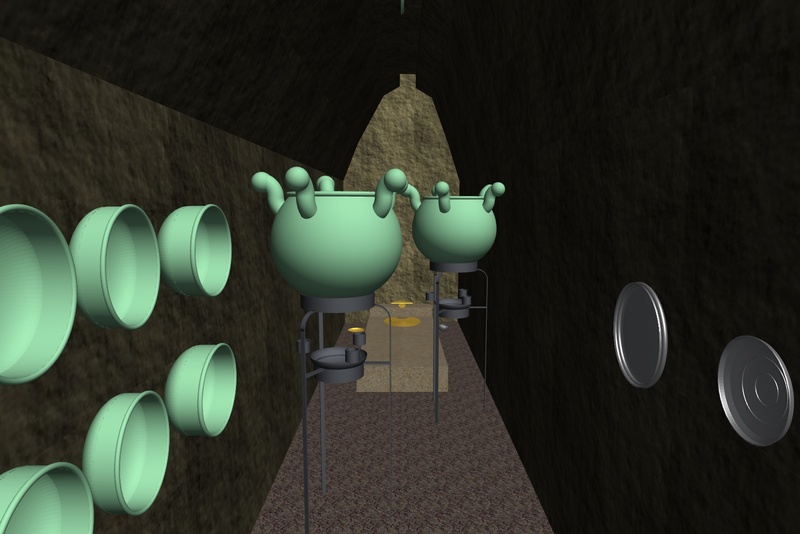 The left niche has a large collection of storage vessels (ollae) and other utilitarian vessels (many of the smaller ones are not depicted). 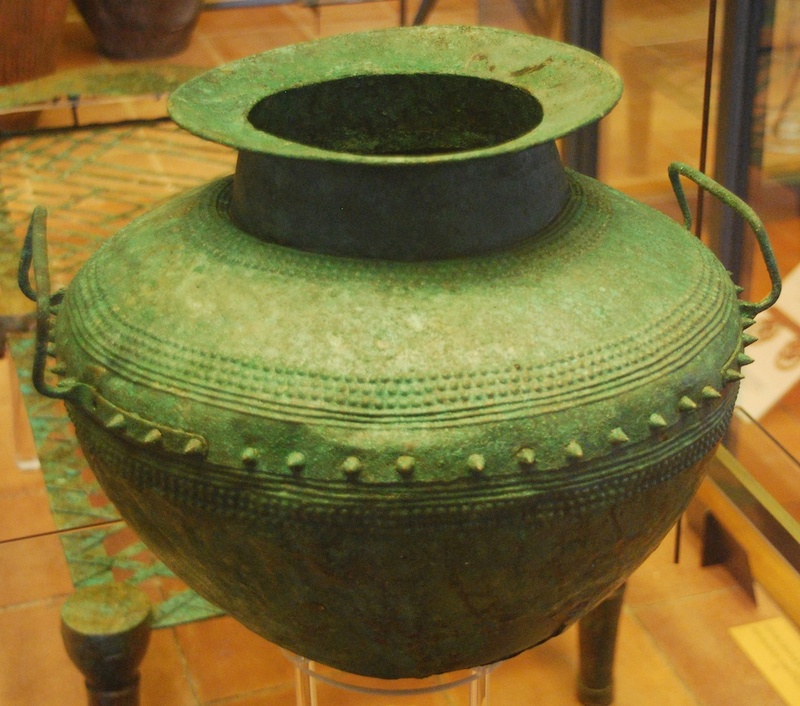 The bronze vessel in the foreground (see image below) is a Villanovan urn that is clearly older than the other objects in the tomb, probably containing the ashes of an ancestor (see also photograph below). 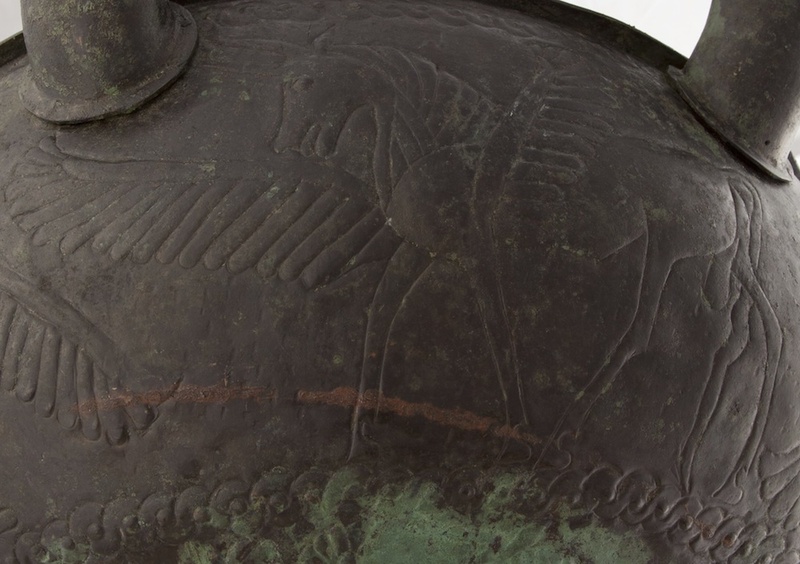 We also have put there the Etruscan inkpot (see also photograph below) that is said to have been found in the Regolini-Galassi tomb. 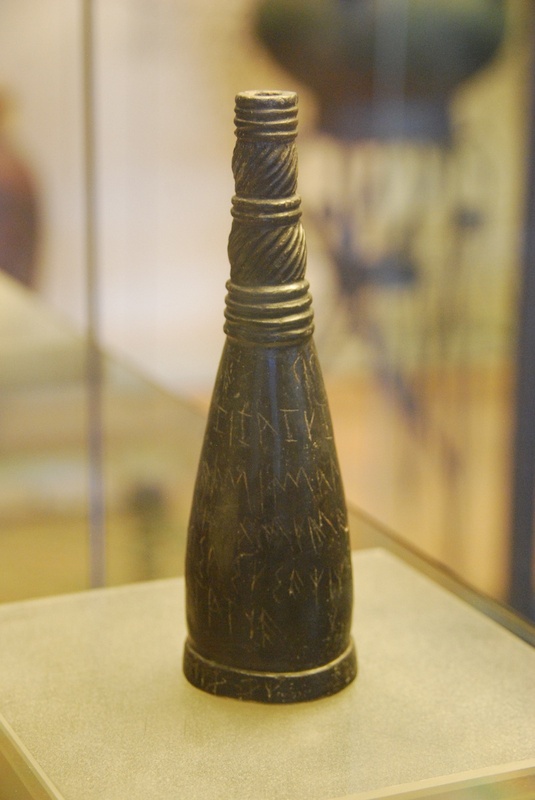 The object is quite fascinating, as it is covered by Etruscan writing, but its function and its provenance are quite unclear. This delicate object looks like it does not belong to a storage room, maybe it should go into the cella or the right niche, as very little is known were it was found during the excavation. 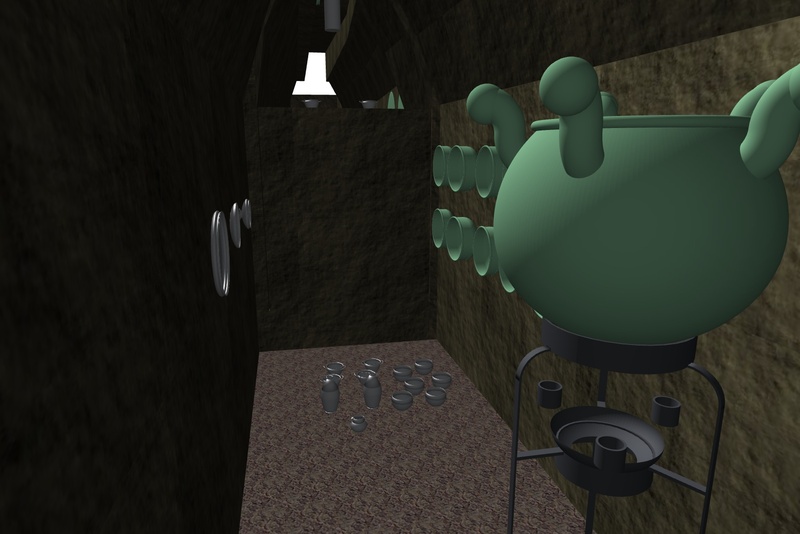 We started putting in also most of the larger objects in the cella. As explained in an earlier post, we have choosen to put the two large lebetes on their respective tripods in the cella. 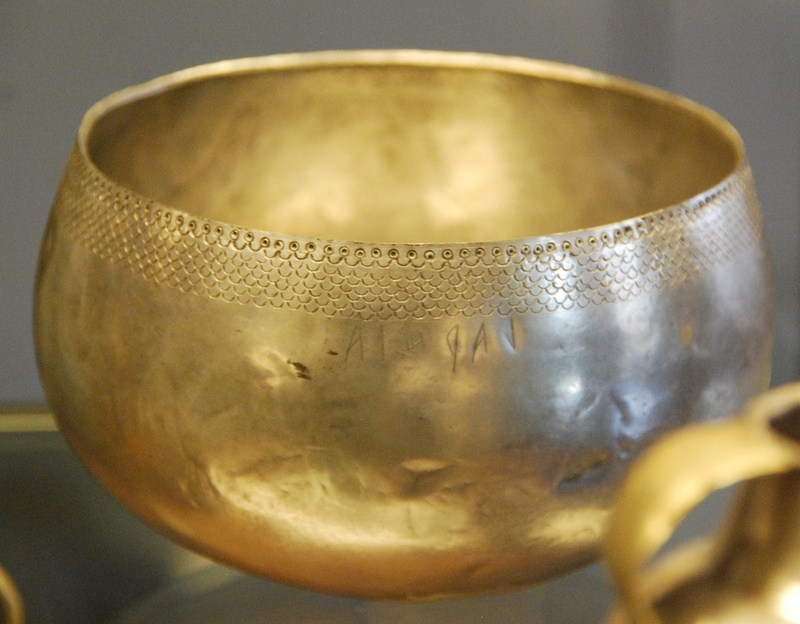 We have added several paterae, a ribbed one (only partially preserved), an undecorated one (see photograph below), and a silver kylix (shallow bowl with foot, see photograph below) plus a set of bronze vessels (see photograph below). On the floor, we have put a large collection of silverware, that is most probably related to the funeral banquet. Most of these splendid objects therefore suffered from corrosion or from the partial collapse of the roof. Some objects nevertheless remain enigmatic. 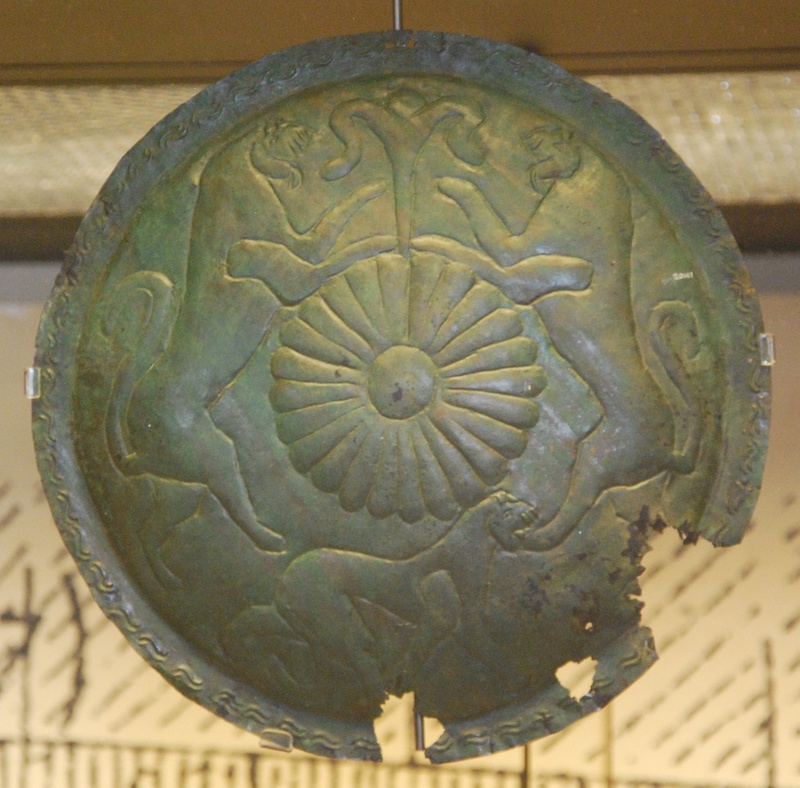 For example, there are four nearly identical decorated bronze discs (see image below), two discs have a lion walking to the left, the other two have a lion walking to the right. Currently, there is no idea what these discs are or how they were used. 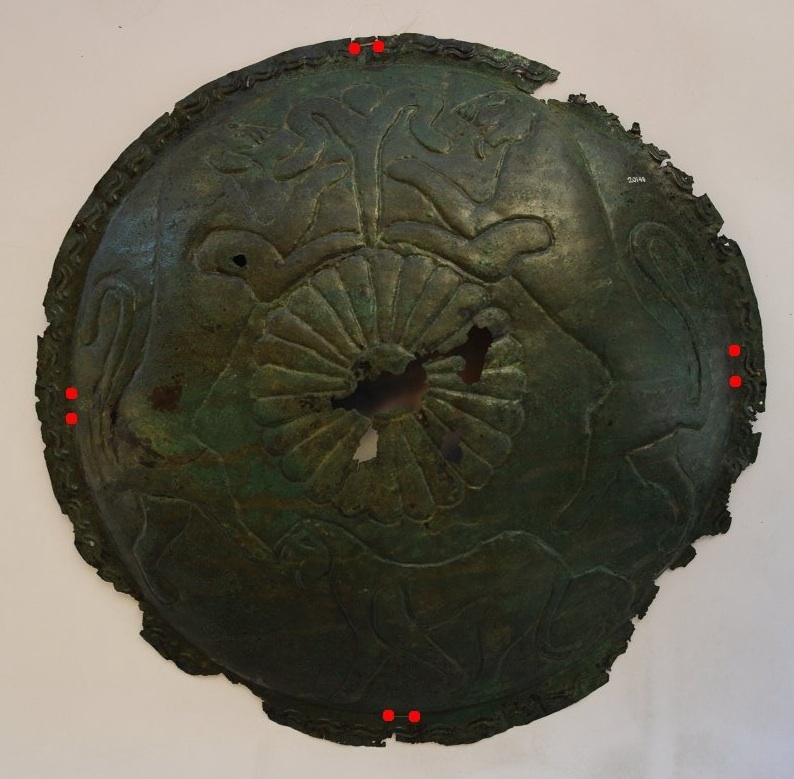 They are too small (40 cm diameter) to be considered as shields, and don’t have the right form to be considered as paterae. All four discs have nail holes, like many other objects in the RG tomb. These nail holes however are quite different, they appear in pairs all around the rim (see image below) and are quite small. The nails are in bronze and appear to have fixed the disc on a softer material than stone, probably wood. The object should be symmetrical to accomodate these 2 by 2 identical discs. 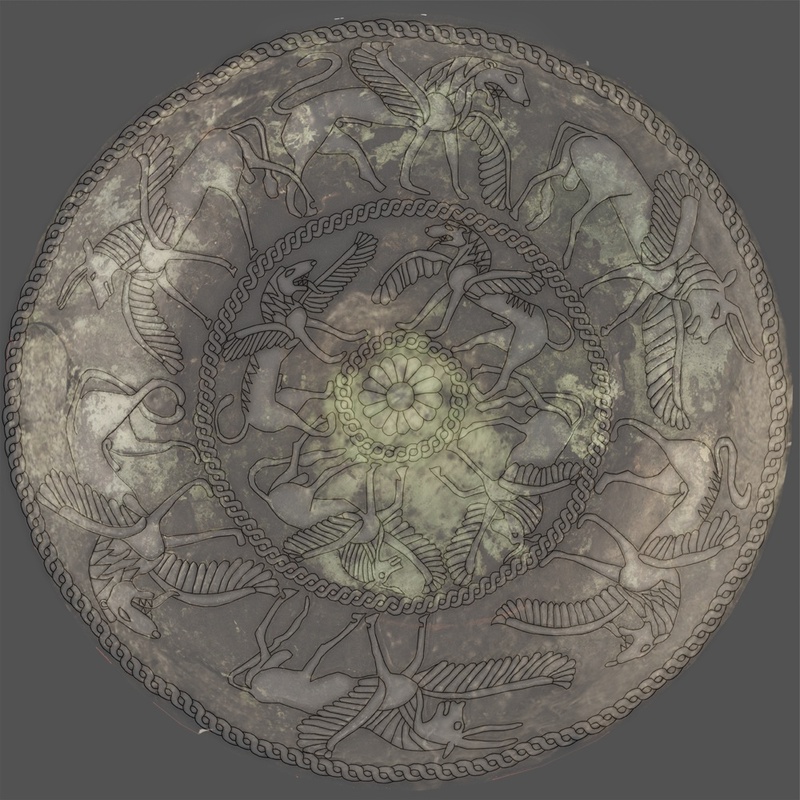 At this moment however, there is no object in the RG tomb that could have served as an obvious basis for these discs. Until recently, a reconstruction of the 4-wheeled chariot, that was used probably to transport the corpse of the warrior, was presented in the Museo Gregoriano Etrusco in the Vatican. Currently, it isn’t on display anymore as the museum wants to revise the reconstruction. 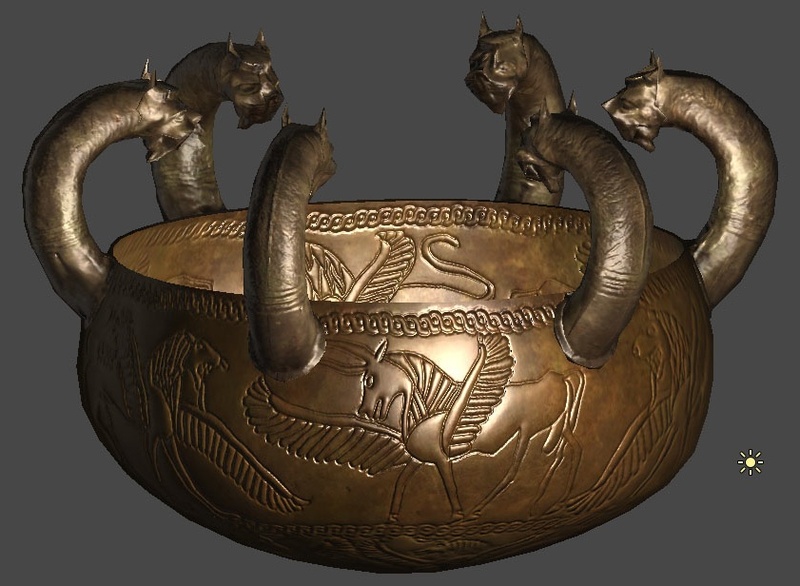 This chariot is currently the only known object in the tomb that could be asscociated with these four bronze discs. 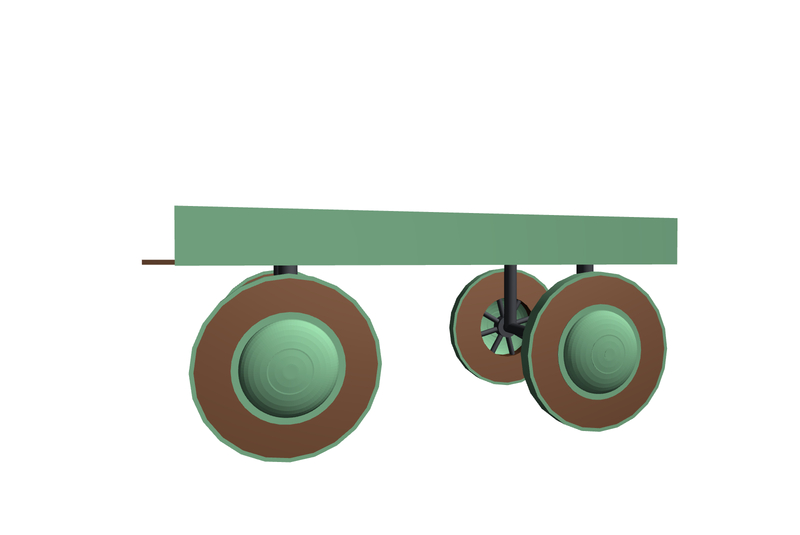 The discs could fit on the wheels and cover the protruding wheel axes. Below, you will find the 3D dummy model of this reconstructed chariot without and with the discs. The result is plausible but not really convincing, the discs are somewhat too small (40 cm diameter) to fit on the presumed wheels (67 cm diameter). Research needs to be conducted on other chariots from other tombs. It is considered quite improbable that the discs would have been fitted on the outside of the biga. So, there aren’t any other alternatives available for the moment, it is completely unclear on what object these discs go. If you have any idea, please do leave a reaction! Most of this blog up till now has been devoted to the inside of the Regolini-Galassi tomb? 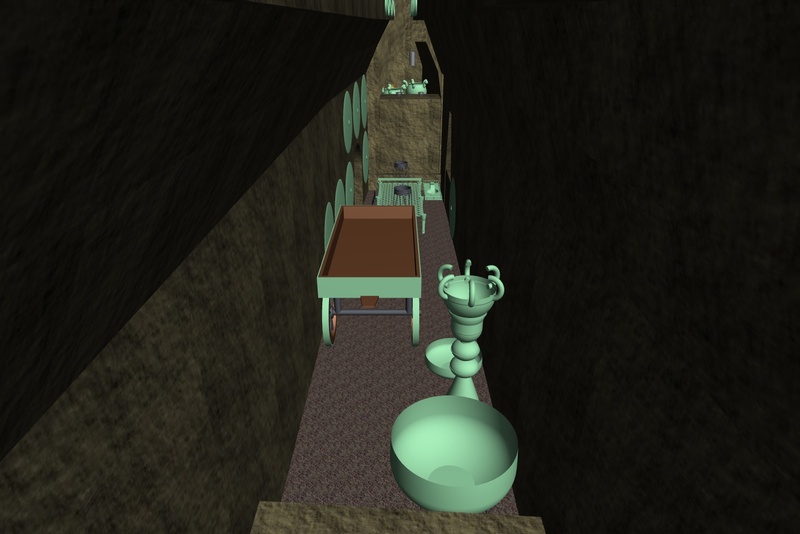 The tomb however was located under a burial mound or tumulus, which we want to show also in the 3D interactive visualisation in Amsterdam and Leiden. So we need to think about the probable form and looks of this tumulus. 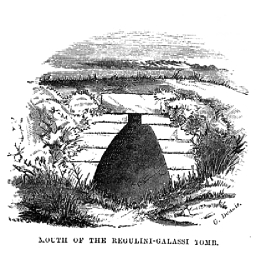 Today, there is very little that remains of the Regolini-Galassi tumulus (see image above). In the 19th century however, there must have been remains of the tumulus still to be seen. Mrs. Hamilton-Gray describes in her book Tour to the sepulchres of Etruria in 1839 on pg. 330-332 “…and were told that this field had once heen a tumulus like those at Monterone, but that the top was now beaten down, whilst the bottom was raised up. It had been broken to pieces, in order to search in all directions for graves, and its pristine form was gone. I do not know its real name, and therefore I shall call it Monte Regulini. By its side stood several other hillocks, which had once been regular tumuli, but which are now all more or less destroyed.” She continues the description of her visit to the tomb: “As we descended, we came upon a wall, probably about three feet high, and similar to what we had seen at Monterone, only more finished.” and “The wall had a coping-stone, very neatly worked, and the basement row of stones were much higher and wider than the other rows.” In other words, it looks like much of the surrounding wall of the tumulus was still present in 1838. She describes the discovery of the tomb as follows: “The ArciPrete had ideas of his own upon the subject, gained by experience. and by following out which, he came upon one of the most extraordinary discoveries of modern times. He excavated from the top until he arrived at a slope, which by steps had led down to a massive stone door towards the centre of the hillock; this he broke, and behold he had gained the wished-for prize!” This description already gives us some elements that are useful in the virtual reconstruction of the tumulus. 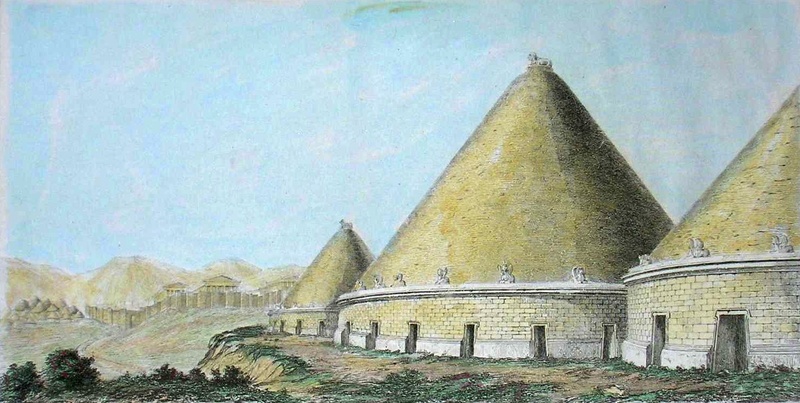 She describes and sketches also the entrance to the tomb as she had seen it during her field visit in 1838. Canina and Grifi must also have seen this wall around the tomb and came up with the following reconstruction and ground plan of the RG tumulus. Surprisingly, they don’t indicate the door. Maybe the complete absence of of remains of the wall at the entrance (as sketched by Mrs. Hamilton-Gray) brought them to not depicting it. Seen the above information, we can consider the horizontal dimensions of this reconstruction and the position of the tomb within the walls to be fairly accurate. 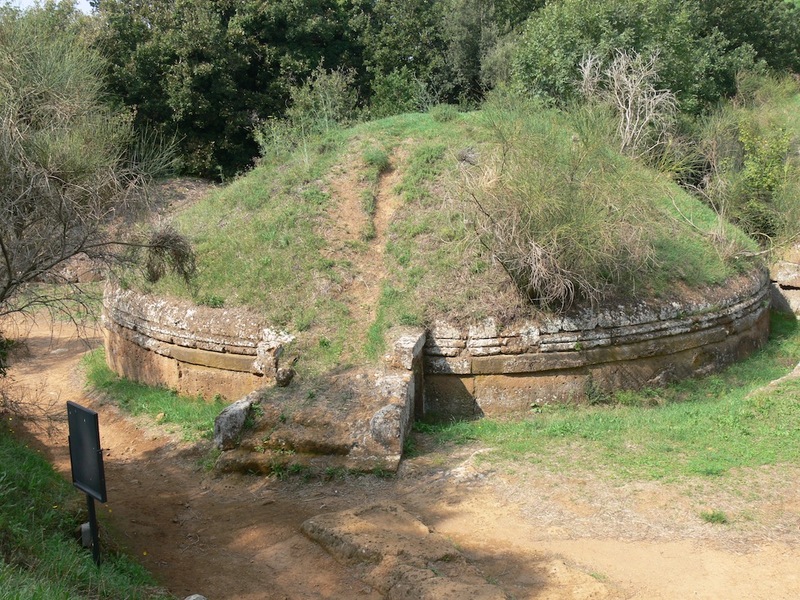 The RG tumulus was covered by a larger tumulus that allowed more burials (presumably from the same family) and was part of a larger necropolis at Sorbo, Cerveteri. A reconstruction of this necropolis was made by Canina. 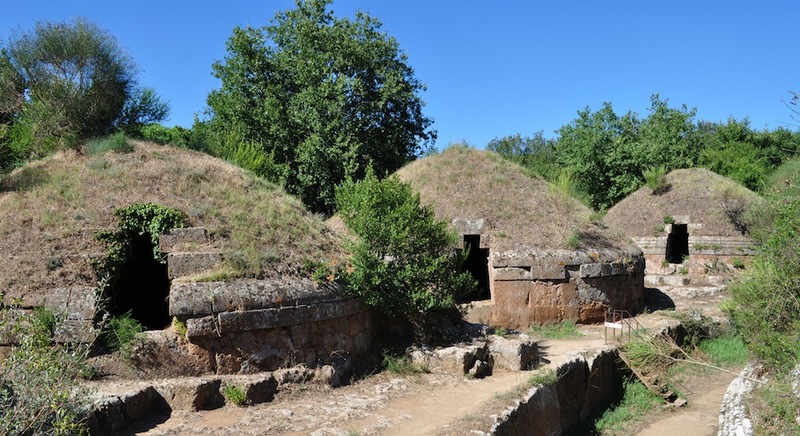 In the image below, we see a series of tumuli (that were described by Mrs. Hamilton-Gray) at Sorbo, but also the more known necropolis of Banditaccia (uttermost left) and the Etruscan city of Caere (now Cerveteri). 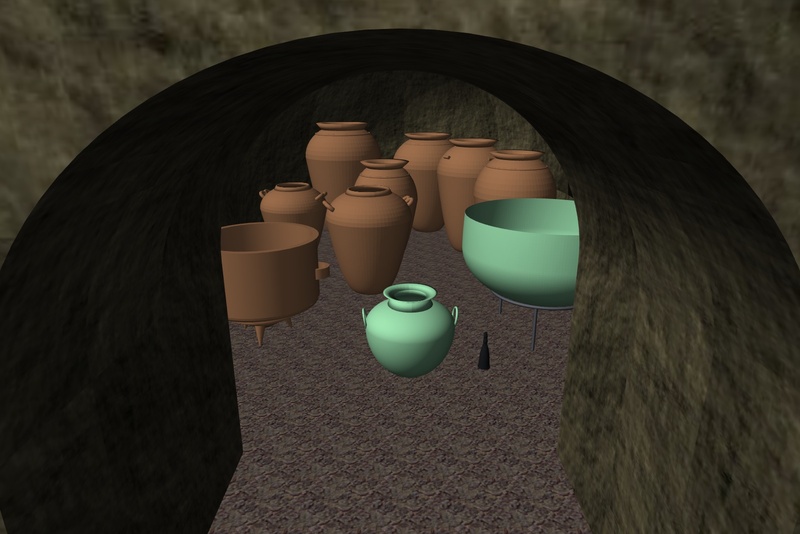 Canina made several other reconstructions of Etruscan tumuli, all very similar (see for example the reconstructions of tumuli in Tarquinia). These reconstructions however raise several issues. 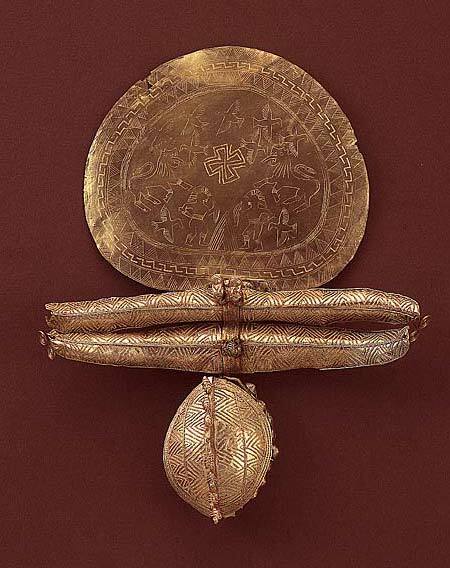 First of all, many of these tumuli are highly decorated, although there is only a limited amount of evidence for that. However, Canina depicted the RG tumulus as undecorated, which is probably the safest bet for an early tomb like the RG one. Secondly, the steepness of the tumulus (51 % at the RG tumulus above) is too high for most soil types to remain stable. A more conservative estimate is 35-40 %, depending on the soil type and on the presence of grass and vegetation. 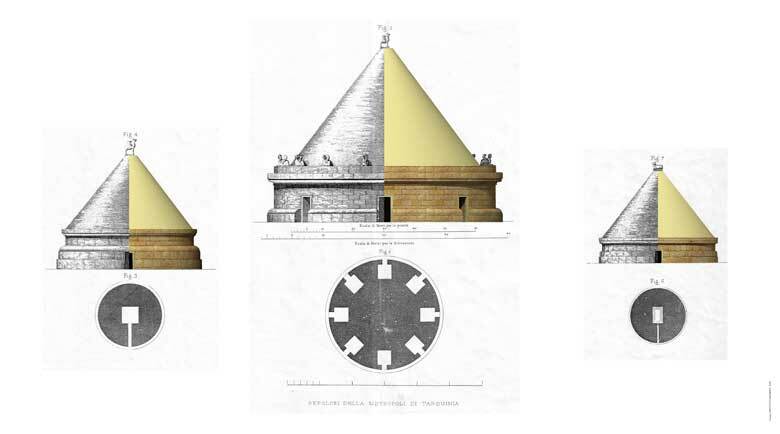 Thirdly, it is quite unsure if the form of the tumulus was a nearly pure cone, over 2000 years of erosion has altered every Etruscan tumulus we know today. Maybe the form of the tumuli was much more hemispherical and closer to what we see today (see images below)? 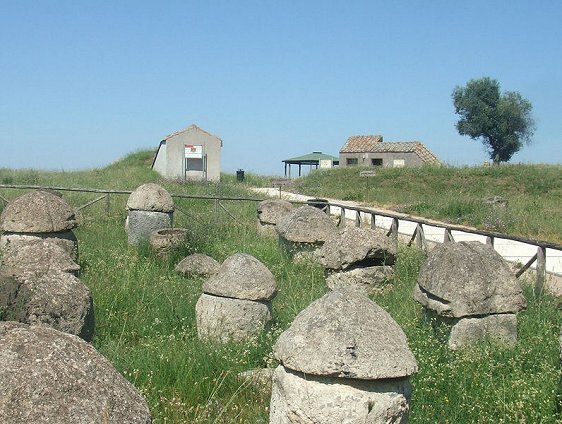 One reason to believe so can be found at the necropolis of Monterozzi at Tarquinia, where older cinerary urns from the Villanovan culture already have a hemispherical form (see image below) that could have been copied into the later Etruscan tumuli. Another possibility is a truncated cone. 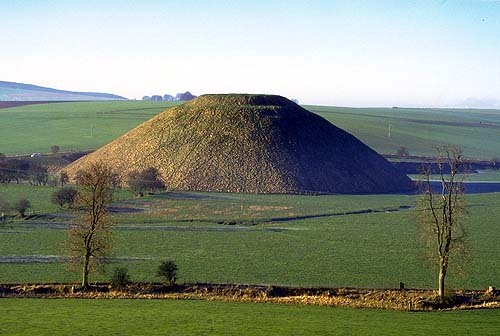 Although Silbury hill in Avebury, England is much older (2400 BC), much bigger and comes from a quite different context, it gives us an idea how such a tumulus could have looked like. Above, we already raised the issue that we have no information on the door of the RG tomb (except for the description of Mrs. Hamilton-Gray above). 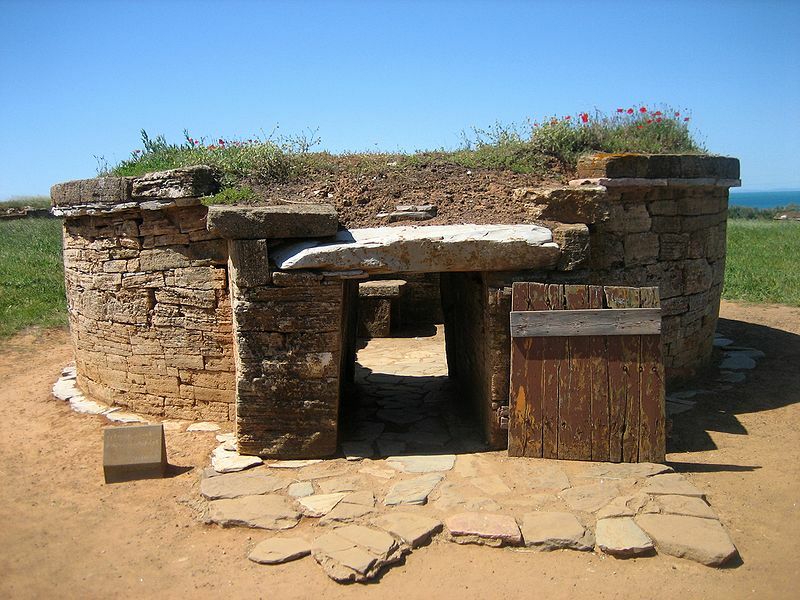 Nevertheless, it was quite possible that the RG tomb had a door, like nearly every other Etruscan tomb (see image below). The alternative is that the the entrance was closed by a continuation of the wall around the tumulus, so that in fact no entrance was visible after the funeral. This would not only make it much more difficult for looters to find the entrance to the grave, but also resembles the Egyptian approach where no entrances where visible to a pyramid. Recent research by CNR-ITABC has shown that it is currently very difficult to find out on site how the entrance looked like, more detailed archaeological research is needed. 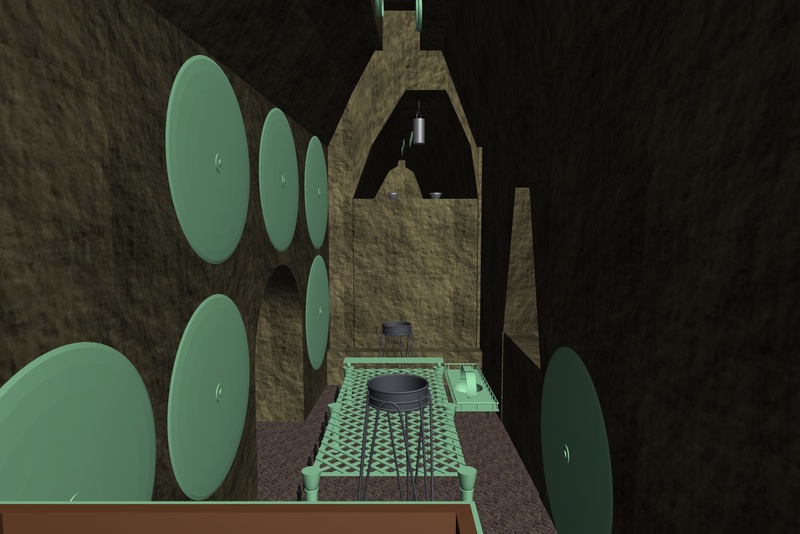 From this research, it looks also like the original floor was more or less level, probably with a few steps when entering. This is consistent with the eyewitness report from Mrs. Hamilton-Gray (see above) who noted from Regolini “…which by steps had led down to a massive stone door…” but also that no steps were visible anymore when she visited the tomb (which is consistent with this CNR investigation that at the entrance there is currently one meter of deposit of earth, as the floor of the tomb is lower than the terrain). 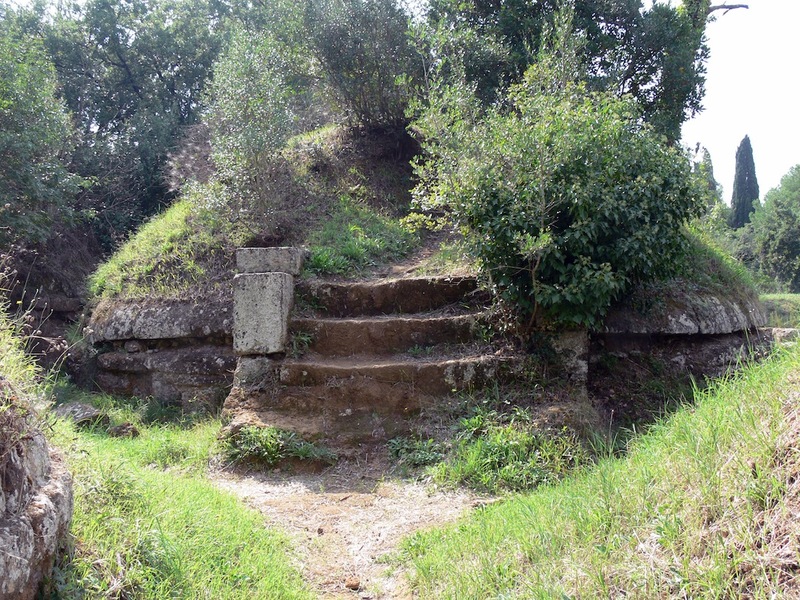 Many Etruscan tombs today show stairs that seem to go up the mound (see image below). Probably some rites or sacrifices were performed on top of the mound. 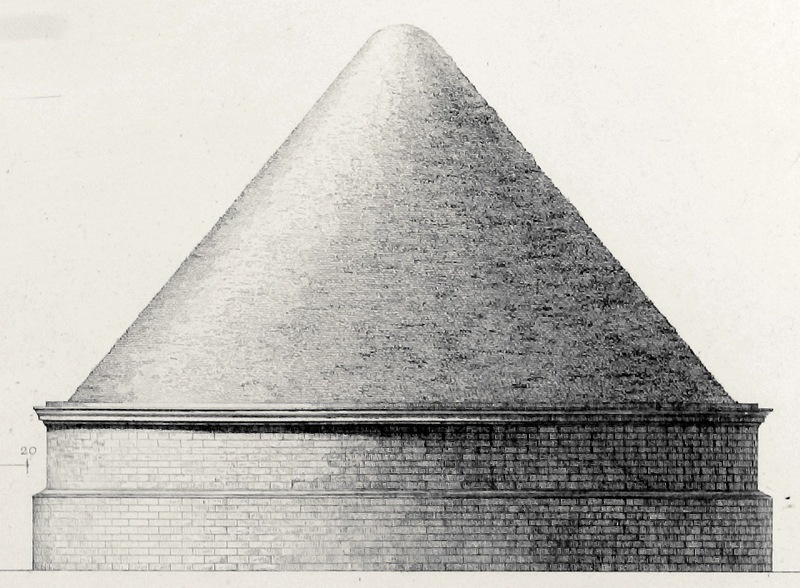 Therefore, the idea of a tumulus in the form of a truncated cone could make sense. Many of those stairs however seem to lead to a platform first and then probably go up the mound. This is the case in most tumuli that have such a structure attached (see images below). 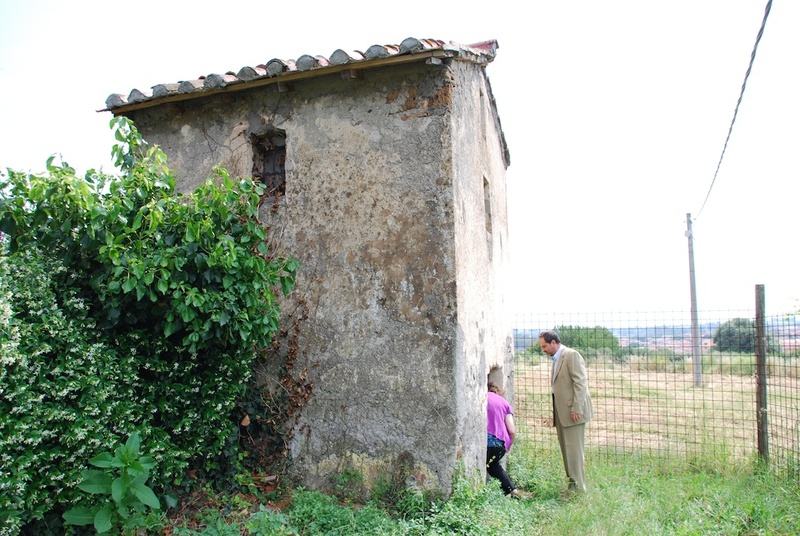 At the Mellone II tomb in Sodo, Cortona, such a separate platform was found intact in 1990, connected to the tumulus. 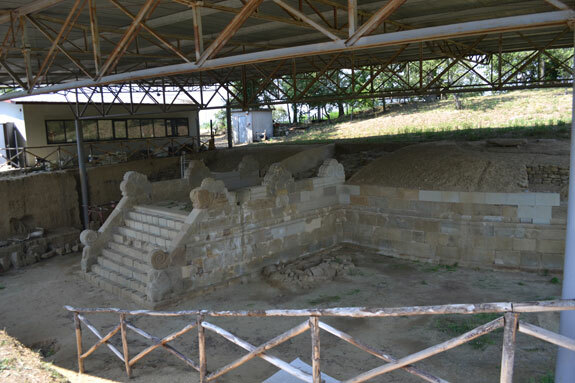 As the cremation of the princeps most probably happened next to the Regolini-Galassi tomb, it is conceivable that this happened on a special place at the tumulus, such as on the top or on a connected platform. 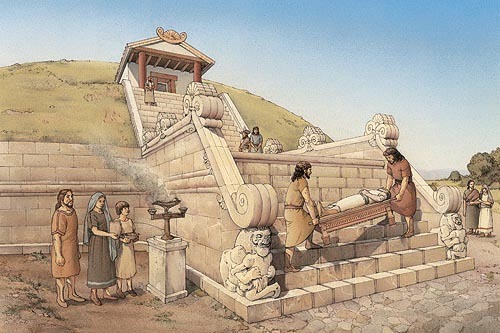 So it is conceivable that such stairs and/or platform need to be added to the 3D model of the tumulus.